This includes thousands of “copyright-infringing” sites, including the likes of The Pirate Bay, which rely on the U.S.-based company to keep server loads down and their location unknown. This is a thorn in the side of many copyright holders who have repeatedly complained about Cloudflare’s role. While the major entertainment giants generally take a diplomatic approach, others are taking their grievance to court. In 2016 Cloudflare was sued for contributory copyright infringement by adult publisher ALS Scan. This case ended in a confidential settlement this summer, but now there’s more trouble on the horizon for the company. The new threat doesn’t come from any of the major entertainment industry players, but from two manufacturers and wholesalers of wedding dresses. Not a typical “piracy” lawsuit, but it’s a copyright case that could have broad effects. In a complaint filed at a federal court in California, Mon Cheri Bridals and Maggie Sottero Designs argue that Cloudflare fails to terminate sites of counterfeit vendors after multiple warnings. This makes Cloudflare liable for the associated copyright infringements, they add. “Plaintiffs have filed hundreds of ‘takedown notices’ with CloudFlare, consistent with the Digital Millenium Copyright Act (DMCA), but CloudFlare has failed and/or refused to respond to those notices by terminating its services to infringers,” the complaint reads. The counterfeit websites selling fake goods are not a new problem. In recent years the American Bridal & Prom Industry Association has filed lawsuits against hundreds of counterfeit sites, resulting in the shutdown of over 1,500 domain names. What is new, however, is that the wedding dress manufacturers are now trying to hold a third-party intermediary liable. The complaint also targets the unnamed ‘does’ behind the allegedly infringing sites, but the CDN provider is the main focus. The allegations are similar to those made in the ALS lawsuit. At the time the CDN provider countered that it was merely caching files and that the infringing content would still be there if Cloudflare was taken out of the equation. The Court disagreed with this assessment, noting that Cloudflare’s cache can be seen as a substantial infringement by itself, which is something the company has control over. That said, it wasn’t determined whether the company itself can be held liable. In the present lawsuit, the two wedding dress manufacturers clearly believe that can be possible. They used the company’s “Counterfeit Technology” to send thousands of DMCA takedown notices, and even though terminating repeat infringers is an option under Cloudflare’s terms, nothing happened. Part of one of the thousands of notices. “Cloudflare has persisted in offering CDN and related services to pirate websites, notwithstanding these numerous notifications of infringement on such sites,” the complaint reads. In closing, Mon Cheri Bridals and Maggie Sottero demand damages for the losses they’ve suffered as well preliminary and permanent injunctive relief to stop all infringing activity. While the case has nothing to do with traditional pirate sites, a ruling could spill over, which means that the entertainment industries will watch this case closely. 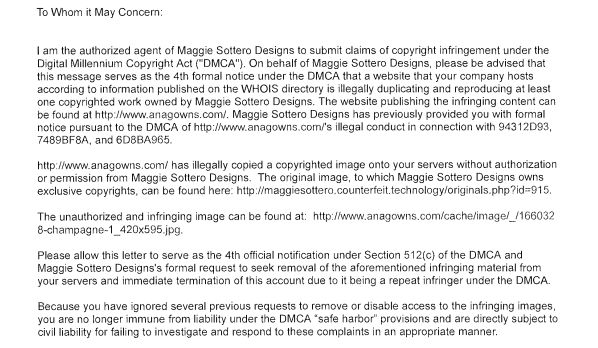 A copy of the complaint filed by Mon Cheri Bridals and Maggie Sottero Designs is available here (pdf).